Etude’s founding philosophy is that winemaking begins in the vineyard long before the harvest and that inspired grape growing diminishes the need for intervention by the winemaker, resulting in an authentic expression of the varietal. This philosophy is brought to life on the Etude Estate Vineyards, tucked away in the far northwest corner of the esteemed Carneros Appellation, close to the elegant state-of-the art winery and tasting room. Etude’s celebrated Pinot Noirs and its small production of Pinot Gris, Pinot Blanc, Rosé of Pinot Noir and Chardonnay are vinified from grapes grown on the Estate while the opulent Cabernet Sauvignon is from vineyards in the prime Cabernet zone, representing the major benchland sub-appellations of Napa Valley – Oakville, Rutherford, St. Helena, Coombsville, and Calistoga. The consistent high quality of the grapes Etude grows and sources, combined with the skill and experience of the winemaking team, explains why Etude is recognized as one of America’s premier artisan wineries. Come visit Etude’s light-filled tasting room in Carneros. Designed by San Francisco architect Matt Hollis, the beautiful building is consistent with the tone and feel at Etude – handcrafted elegance. Walk-ins welcome seven days a week from 10 - 4:30. Tastings are generally 30 minutes and cost $20 per person for tasting of five wines. Try our private gourmet tasting experience that explores the subtle nuances which make wine and food such a great pairing. Join us for a flight of 5 Etude Wines paired with 3 savory bites or selected gourmet cheeses Friday thru Sunday at 10:00 a.m., 1:00 p.m. or 3:00 p.m. Cost is $35 per person ($25 for Wine Club members); Maximum of 8 people; Reservations required to 707-257-5300. 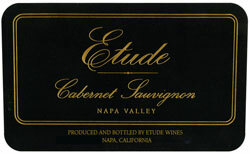 To join the wine club, visit www.etudewines.com or call 877-586-9361. Etude offers two distinct Wine Clubs to meet the needs of its loyal followers. Experience the full breadth of our portfolio with shipments offering a taste of Etude's unique expression of each varietal. Shipments include both red and white wines. up to 4 bottles per shipment. Discover the full spectrum of Pinot varietals with quarterly shipments of Pinot Noir, as well as Pinot Blanc and Pinot Gris. Enjoy $10 off a tasting. Etude is certified under the Napa Green Winery Program by the Napa County Department of Environmental Management (DEM) and the Association of Bay Area Government’s (ABAG) Green Business Program and completed all the regulatory components needed for environmental sustainability. These components included developing water and energy conservation methods, preventing pollution, and reducing solid waste. In addition to developing sustainable winery practices, this program is set to become the standard for the state of California. Etude is certified under the Napa Green Certified Land Program. Etude has created and implemented a customized farm plan with measured results that addressed all aspects of its property, vineyard land as well as non-farmed land, including practicing soil conservation, water conservation, stable drainage, riparian corridor enhancement, fisheries and wildlife habitat enhancement and long-term improvement and sustainability.